One in four college students leaves with more than $5,000 in debt, a TrueCredit.com study shows. One in 10 leaves with over $10,000 in debt. When you’re just graduating college, getting your first real job, and trying to make it on your own, credit card debt is the last thing you need to worry about. You’ll have rent and utilities to pay, possibly a car note, and student loans if you used them. That’s more than enough for one 20-something, just out of college, to think about each month. Before you head off to campus this fall, make sure you understand some basics that will help you stay out of credit card debt. College students are a credit card company’s prime prospect. (If you haven’t seen the documentary Maxed Out, watch it before you step foot on campus.) They like to get you while you’re young for a couple of reasons. First, they have a strong hunch that your parents will bail you out if you run up your credit card bill. Second, you have a long credit life ahead of you. That means lots of years of interest payments for the credit card companies. In the past, credit card companies were so hungry for college students, they approved applications even when students didn't meet the criteria. For example, a college student could get a credit card with no job, no verifiable income, no credit history, and even without a co-signer. Recent changes to credit card law now require credit card companies to verify a student's income before giving a credit card them a credit card. Students without income must get a cosigner to qualify. If you see a credit card company on your campus, they've likely paid your college administrators a fee, sometimes millions of dollars, for the ability to market credit cards to you. Colleges also get a kickback from every credit card opened and sometimes a percentage of charges made. 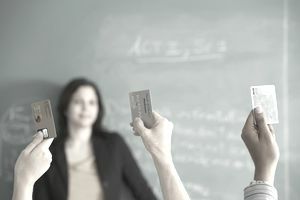 Credit card companies pay to sell credit cards to students because they're banking on students making up for it in interest charges and fees. Credit card companies truly understand the college demographic. You can tell by the marketing tactics they use to lure young adults into applying for new credit cards. These tactics mainly involve giving something away for "free." Expect to see credit card company representatives on or near campus giving out free stuff for credit card applications. Law prohibits them from giving away tangible items like t-shirts or frisbees on campus, but the law doesn't forbid intangible items, like a coupon for a free sandwich at a local restaurant or a statement credit on your new credit card. And credit card companies may even give away tangible items, just at a location that's off campus. Free things are nice, but this isn’t the way to sign up for a credit card. Shouldn't you be suspicious of a company who bends the rules to try to give you a product? It isn't just a free sandwich you're getting when you sign up for a credit card. You're signing up for a ticket to the Broadway musical Debt, starring you. Whether you attend or not, is up to you. When you’re ready for a credit card, don’t sign up for the first one that comes your way. Instead, comparison shop the way you would for a new car. Look at a few different credit cards and pick out the one that’s the best deal. At a minimum, your credit card should have no annual fee and a low-interest rate. Tables and booths on and near campus are just one-way credit card companies try to get to students. Now, they've started emailing students and soliciting credit card sign-ups on Facebook. Credit card companies are forbidden from giving credit cards to students and young adults under age 21 who don't have a steady income or a cosigner. However, the law doesn't specify what qualifies as income or what type of proof credit card companies must receive for credit cards. The bottom line is that no matter how attractive the card or the free gift may seem, you’re better off looking for your own credit card. Use credit responsibly so you’re not the one out of four that graduates with thousands in credit card debt.